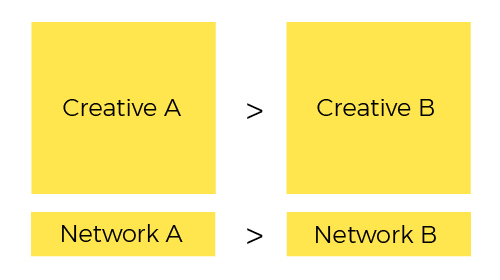 In the illustrative graph above, Creative A outperformed Creative B, but Network A also outperformed Network B. When creative bias occurs, as it would in this case, it is hard to tell whether a certain creative outperformed the other because of the difference in their messaging, or because they aired on different networks and rotations. To allow for an apples-to-apples comparison between TV creatives, it is therefore important to de-bias the effect of such factors. At Tatari, we have implemented a model that de-biases performance in two major steps. First, comparisons between each pair of creatives are made across every network on which these creatives aired. This step is essential as it informs our model which attributes to weigh more heavily in the calculation of final performance. Second, differences in spend distribution are then normalized to isolate the effective impact of creative performance. This allows us to compare creatives that aired on different networks with different amounts of spend. Once our model completes these steps, we report creative performance in form of adjusted efficiency. Adjusted efficiency shows advertisers how their creatives performed while minimizing the biases due to spend distribution inequalities. As mentioned earlier, it is worth noting that this bias is an inherent complexity of TV advertising and the related nature of media-buying. A typical A/B testing is therefore not possible with linear TV—those advertisers who present creative performance results without de-biasing can sometimes end up with incorrect results.